Did Super Bowl Ads Score App Store Success? With an estimated 112 million viewers tuned in to the 49th Super Bowl on Sunday night, a lot of talk had nothing to do with the game or sport itself. Instead, there was a lot of hype over three different games — the kind you play on your phone, and that were advertised in between all that football. The hefty price tag ($4.5 million for a 30-second slot) succeeded in getting people talking, but was it worth it? 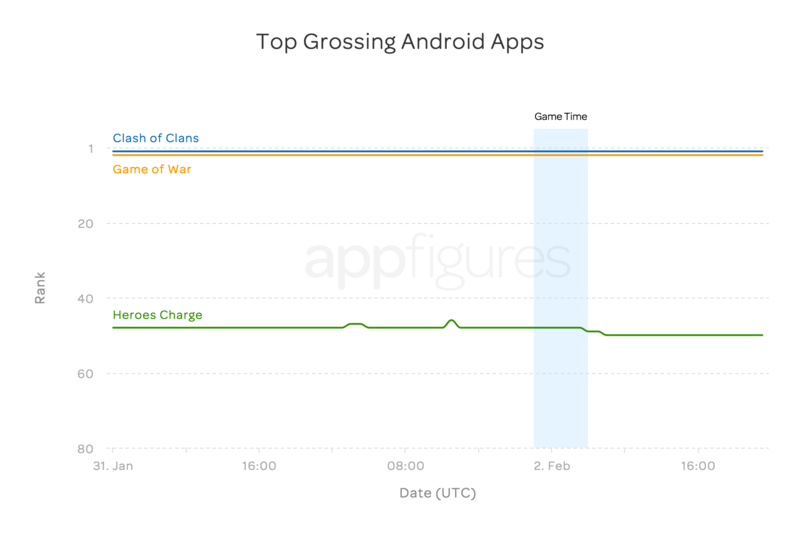 We tracked the U.S. ranks for all the ads that ran during the game: Clash of Clans, Game of War and Heroes Charge over the weekend to see if the coveted Super Bowl ad slots translated into app store success. Let’s start with what matters — revenue. 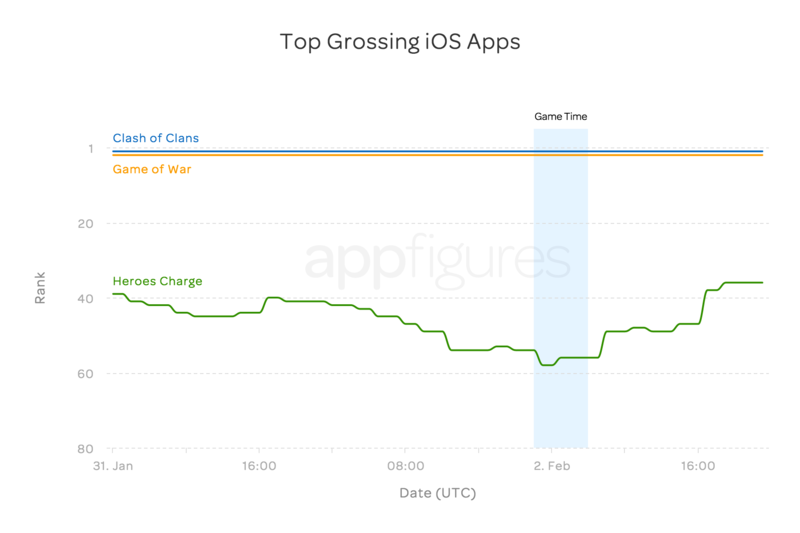 Starting with a look at the Top Grossing chart for the U.S., we see that, unsurprisingly, this chart isn’t too exciting. Why are we not surprised? Well, mostly because all three apps are freemium games that monetize with in-app purchases. Unlike paid apps, monetizing with in-app purchases can take longer and has a long tail, so changes to this chart will be gradual and take time. Let’s take a look at a more important metric — downloads. Things move quickly in the iOS App Store, so here we see more immediate results. 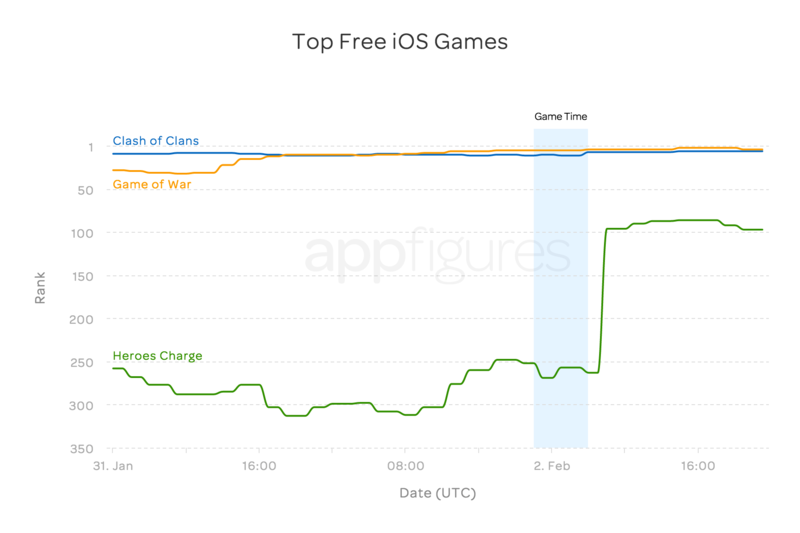 These apps were reeling in a lot of new downloads (and increasing their chances of converting these users later with IAP’s). 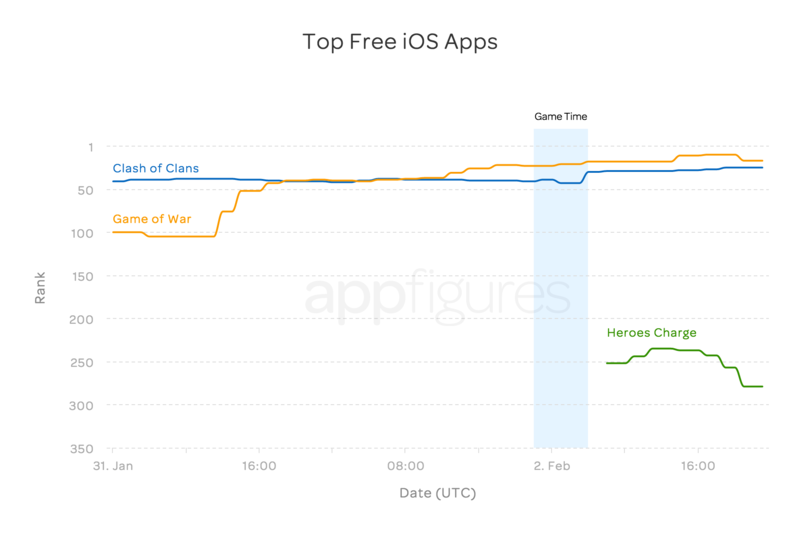 Game of War got the most downloads of the three in this category for iOS, even succeeding in pushing Clash of Clans down a few slots. 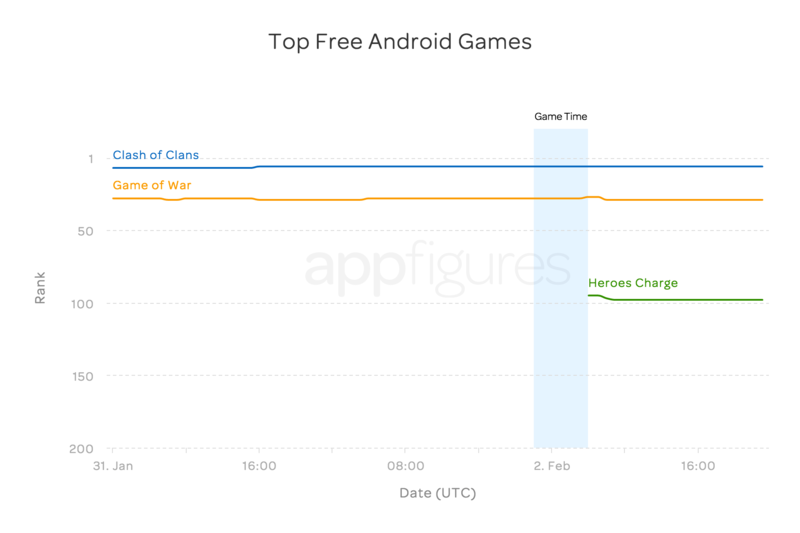 However, Clash of Clans must have received a similar number of downloads, as it managed to bounce back. Finally, Heroes Charge made a brief climb, peaking at 86th in the Games category, which shows some success, even though it was not sticky, that it had previously been unable to achieve. 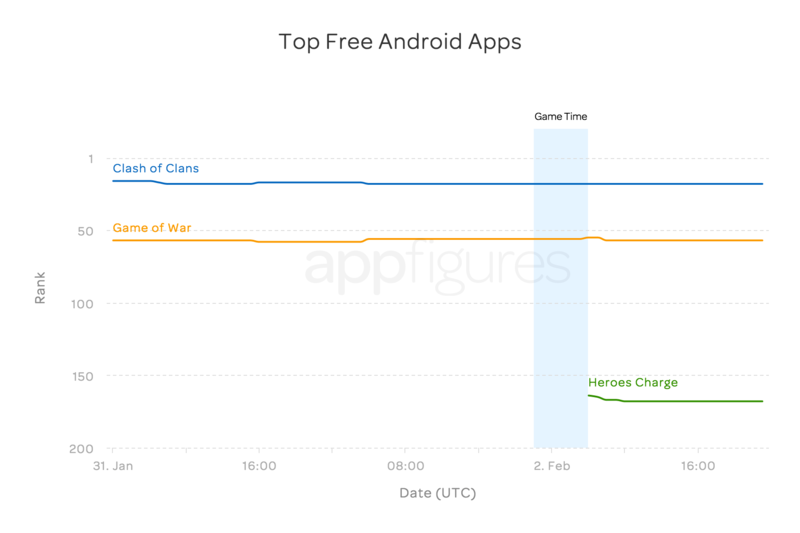 We see Game of War started moving a few days prior to the Super Bowl, which could be due to the larger ad campaign they recently launched. Commercials starring Kate Upton have been getting a lot of airtime as well as pre-game hype, which may have started to boost downloads prior to the game. Additionally, this ad took place during the first Quarter, which left the audience with a longer time after it aired to head to the app stores and give it a try. Google Play isn’t as exciting for sure, but there’s still interesting information here. Although the two mega titles didn’t move much, the new player, Heroes Charge was able to break into the top charts, both in the Games category and Overall. So far it looks like it’s sticking. Given that the two leaders are…well, leaders, while they were still getting plenty of downloads (which caused them to continue the ascent up the ranks into Tuesday), these weren’t yet enough to push them up immediately following the game. To answer our original question, Yes — buying a really expensive TV spot is a sure-fire to get your app a good amount of downloads and even put you on the map if you weren’t. Whether it’s the only way to achieve that is an entirely different question. If we learned one thing from this campaign it’s that when it comes to user acquisition, Kate Upton has a leg up on Liam Neeson.